He is on a two-day visit to Kenya for bilateral talks with President Kenyatta where the two leaders are said to have explored ways and means of strengthening relations between Kenya and DRC. 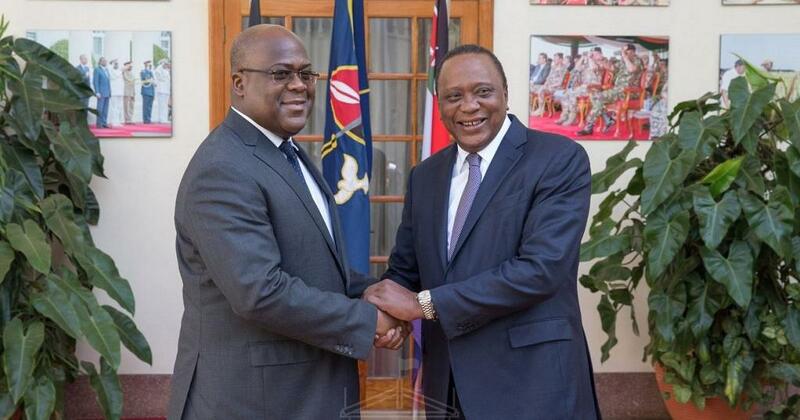 Newly elected Democratic Republic of Congo (DRC) President Felix Tshisekedi Wednesday met both President Uhuru Kenyatta and ODM leader Raila Odinga during his maiden visit to Kenya. President Tshisekedi’s visit to Kenya comes barely 14 days after his inauguration which was attended by President Kenyatta, accompanied by Mr Odinga, among other leaders. Mr Kenyatta was the only foreign Head of State present during President Tshisekedi’s swearing-in. 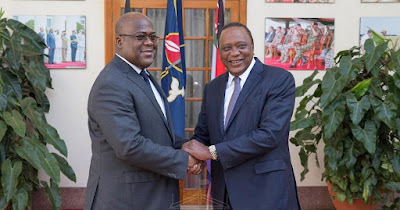 President Kenyatta assured Mr Tshisekedi of Kenya’s commitment in helping DRC achieve political stability saying that Kenya has learnt valuable lessons from past political tensions, which the country is willing to share with others. “We will continue to help you achieve peace and stability because we have had similar experience which we can share. Our country has been able to calm down political temperatures through the famous Building Bridges Initiative,” said President Kenyatta at State House. He said Kenya will partner with DRC in capacity building by offering training opportunities to Congolese public servants in Kenya’s training institutions such as the Kenya School of Government. On trade, President Kenyatta observed that a lot of Congolese imports pass through Mombasa port, especially goods destined to Goma and Lubumbashi on the eastern part of DRC, and called for the deepening of trade ties going forward. He acknowledged the important role played by Mombasa port to the economic well-being of DRC, saying his country is willing to join the East African Community so as to deepen its economic ties with the region. The two leaders agreed to plan for reciprocal state visits once the newly-elected President forms his government. Meanwhile, Mr Odinga called on President Tshisekedi to unite the country by embracing players from diverse backgrounds, asking him not to allow cracks that could be exploited by foreign interests. He also congratulated him on his election and for the first peaceful transfer of power in DRC in close to 60 years. Meanwhile, President Kenyatta has assured Zimbabwe of Kenya’s support to ensure that the sanctions imposed on the southern Africa nation are lifted, saying the sanctions were holding Zimbabwe back.